I live in New England. Like many other areas, we have cold, dry winters. Springs are often not much better. As a consequence, I must store my guitars in places I can humidify and perhaps also protect from rapid temperature changes. But it’s now June and as you can see in the photo, the humidity and temperature are no longer a threat to my guitars – at least low humidity and temperature are no longer a threat. That means my guitars can come out of hiding. Yay! 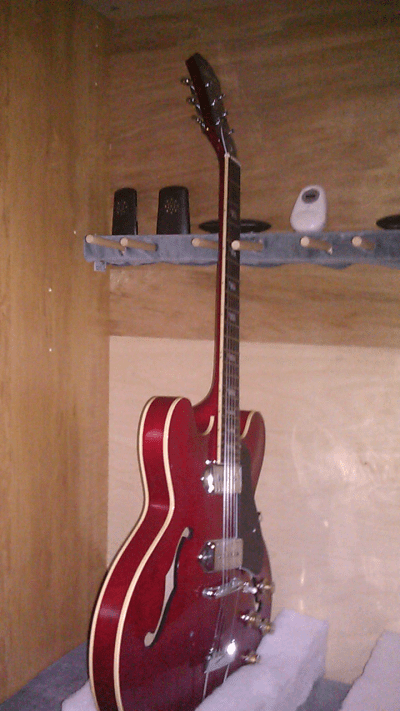 During the dry seasons, I store my most vulnerable guitars in a cabinet I’ve appropriated from the trash. I’ve sealed the cabinet as best I could – though I intend to make it more air-tight at some point. This serves as my humidified guitar cabinet. 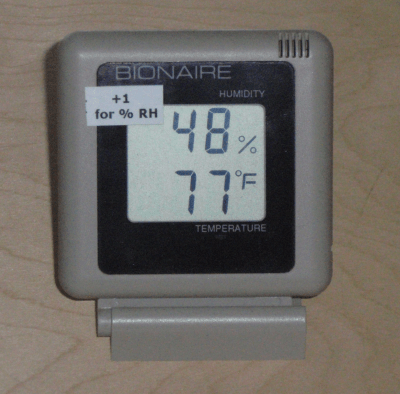 My acoustic guitars are stored here whenever the humidity is no longer reliably above 40%. I’ve also modified the interior to keep 4 guitars from falling into each other. I humidify the chamber with a large plastic food storage container (Glad) filled with water. A small fan circulates the air. This homemade humidifier sits on a shelf above the guitars (not shown in left photo). 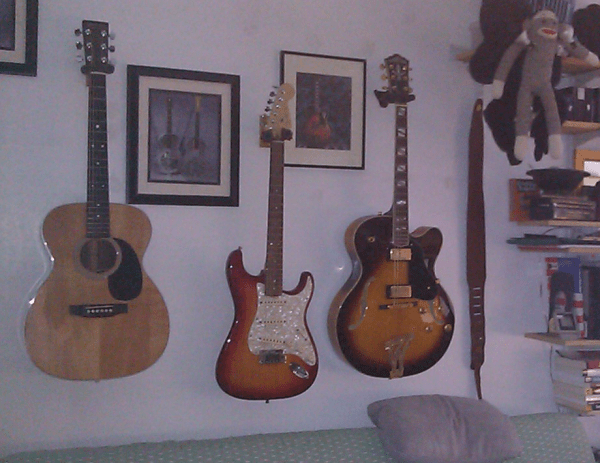 Now the guitars can go up on the wall where they are more accessible – meaning I’m more likely to just pick one up and play it. Next Post:How do you know when the humidity is too low for your guitar?